As the negotiators struggle on in Paris at COP21, the question of the long term goal has emerged. What should it be, how should it be structured and will it send the necessary signal to drive future national contributions. The idea of a goal goes back to the creation of the UNFCCC. There is the original text agreed when the Convention was first written in 1992, i.e. “. . . stabilization of greenhouse gas concentrations in the atmosphere at a level that would prevent dangerous anthropogenic interference with the climate system . . . “. At COP16 in Cancun, the Parties to the UNFCCC reformulated this as a numerical goal; the need to limit warming of the climate system to no more than 2°C above the pre-industrial level with consideration for reducing this to 1.5°C as the science might dictate. This seems very clear, but in fact offers little immediate guidance to those attempting to establish a national or even global emissions pathway. The climate system is a slow lumbering beast and the global temperature could take years or even decades to settle down once there is stabilization of carbon dioxide (and other greenhouse gases) in the atmosphere. It could be decades after that before we are collectively sure that no further temperature rises will take place. But the science has shown that the eventual rise in temperature is strongly related to the cumulative emissions of carbon dioxide over time, starting when emissions were negligible (say 1750) and running through several centuries (e.g. to 2500). Myles Allen et. al. 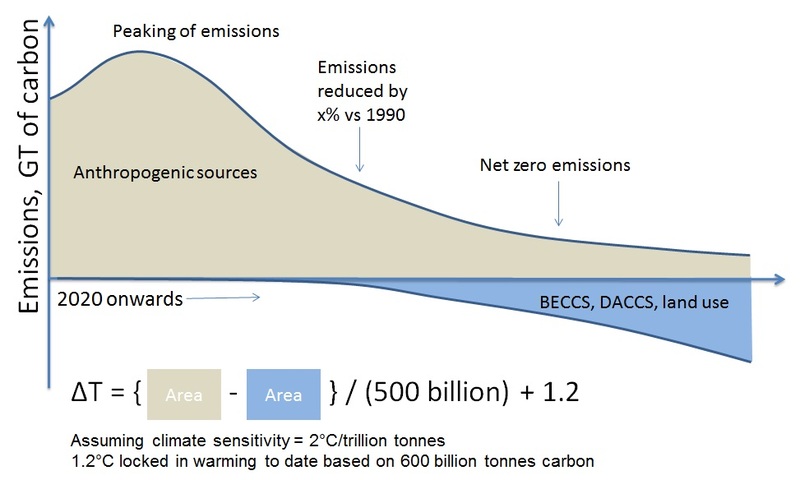 from Oxford University equated 2°C to the cumulative release of one trillion tonnes of carbon, which offers a far more mechanistic approach to calculating the point at which 2°C is reached. So far, cumulative emissions amount to some 600 billion tonnes of carbon. However, even this approach has uncertainty associated with it in that the actual relationship between cumulative emissions and temperature is not precisely known. If emissions stopped today, it is very unlikely (but not a zero chance) that warming would continue to above 2°C, but if emissions were to stop when the trillion tonne threshold is reached then there is only a 50% chance that the temperature would stay below 2°C. The agreement in Cancun doesn’t cover uncertainty. The Oxford University team have developed a website that counts carbon emissions in a bid to familiarize people with the concept. As of writing this post, it was counting through 596 billion tonnes and provided an estimate that 1 trillion tonnes will be reached in October 2038. The INDCs already reach out to 2030 and as they stand, will not put the necessary dent into the global emissions profile that is needed to avoid passing one trillion tonnes. In terms of energy system development, 2038 is in the medium term. Most forecasts out to this period, including the IEA New Policies Scenario which factor in the INDCs, show energy demand and emissions rising over that period, not falling. In line with the Cancun Agreement, a number of Parties have maintained the need to lower the goal to 1.5°C, but particularly those from low lying island states who are justifiably concerned about long term sea level rise. This goal is being voiced more loudly here in Paris. Using the relationship developed by Allen et. al., this implies that 1.5°C would be exceeded if cumulative carbon emissions passed 750 billion tonnes, which could happen as early as 2027. This would imply a massive need for atmospheric CO2 capture and storage over the balance of the century for the simple reason that cumulative emissions could not be contained to such a level by energy system reductions alone. More recently the concept of net zero emissions (NZE) has emerged. This is the point in time at which there is no net flow of anthropogenic carbon dioxide into the atmosphere; either because there are no emissions at all or if emissions remain because they are completely offset with a similar uptake through carbon capture and storage or reforestation and soil management. Emissions are likely to remain for a very long time in sectors such as heavy transport, industry and agriculture. NZE has been closely linked to 2°C, but in fact any temperature plateau, be it 1.5°C or even 4°C requires NZE. If not, warming just continues as atmospheric CO2 levels rise. There is now a discussion as to when NZE should be reached – as early as 2050 (but practicality must be a consideration), or perhaps by the end of the century. However, what is actually important is the area under the emissions curve before NZE is achieved, less the area under the curve after it is reached, assuming emissions trend into negative territory with technologies such as direct air capture or bioenergy with carbon capture and storage (DACCS or BECCS). The date at which NZE is reached is important, but not necessarily an indicator of the eventual rise in temperature. Just to complicate matters further, although the world needs to achieve NZE eventually, it may be the case that net anthropogenic emissions do not have to be zero by 2050 or 2100 to meet the 2°C goal because of carbon removal arising from natural sinks in the oceans and terrestrial ecosystems. Other proposals put forward by Parties and some observers simply call for an urgent peaking of emissions. This is important as well, but again it doesn’t tell the full story. What happens after the emissions peak is critical. A long slow decline to some plateau would be positive, but unless that plateau is close to NZE, then cumulative emissions continue to build, along with the associated warming. Other proposals argue for emissions to be at some reduced level by 2050, which presumes a certain follow-on trajectory equating to 2°C or thereabouts. Where the Parties land in this discussion remains to be seen, but with only days left and the complexity of goal setting becoming apparent, this may end up being an issue for the years ahead rather than one that can be fully resolved in Paris in a week. 2°C may have to do for now.